You’ve read it here before: This is not Jamba Juice. If you’re old-school, it’s not Orange Julius. Or Smoothie King. Today I have a big girl (big boy) smoothie recipe. You’ve been warned. As I type this, I’m on the brink of getting over a cold…one that feels like it could go either way – linger on and on, or be gone by tonight. I’m using some of my favorite tried and true high-nutrient foods to support my immune system, break up mucus, and get me back to feeling great. Even if it’s not a cure-all, some of the ingredients relieve symptoms enough to help me get through the day better, which is good enough for me. 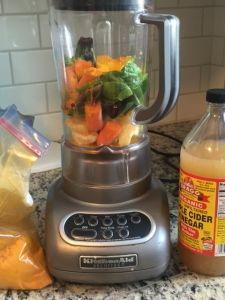 Try this smoothie to get yourself over a cold, start your day, week, month, or year off right, or just add some much-needed turmeric and carrots to your diet. Place all ingredients in a blender and blend until smooth(ie). Carotenoids: Along with spinach and pumpkin, carrots are among the kings of carotenoids. Specifically, carrot contain the super antioxidant, beta-carotene. As most of us know even from early childhood, carrots and high blood beta-carotene levels are good for your eyes, specifically the prevention of glaucomas a we age. Polyacetylenes as an anti-cancer agent: The polyacetylenes found in carrots inhibit colon cancer cell growth. In fact, the polyacetylenes and carontenoids in carrots seem to work together to reduce these growths, with the carontenoids protecting the nutrients in the carrots (antioxidant action for the polyacetylenes) and our own cells. Cardiovascular Health Protection: A recent 10-year study from the Netherlands has shown a strong correlation between carrot intake and reduction in cardiovascular risk. In fact, carrots emerged as one of the most potent cardiovascular health benefactors among fruits and vegetables. Healthful Nutrients: Beyond it’s unique healthful qualities, carrots also provide Vitamin C, B Vitamins, minerals such as copper, calcium, potassium, manganese and phosphorus, and fiber. Carrots are incredibly easy to add to any eating plan, easy to pack, and doesn’t need any special prep (just wash and eat without peeling!). Is a powerful antioxdant. In fact, both the volatile oils and the actual yellow/orange pigment of the turmeric plan exert powerful antioxidant effects. They neutralize free radicals and reduce their damage to our cells and tissues. They also provide anti-inflammation benefits, and specifically reduce joint swelling and pain associated with joint overuse when consumed regularly. Acts as an effective treatment of inflammatory bowel disease and digestive issues. Believe it or not, the nutrients in turmeric safely relieve colitis symptoms, and can remain protective for the gut for days after consumption! Reduces risk of cancers, improve cystic fibrosis symptoms, and relieves arthritis pains! Like many spices, turmeric is an all-around great food that should be included as a regular component of our diets. In terms of cold and flu relief, the cumcurin in turmeric has strong anti-viral and anti-bacterial properties which may reduce coughs and congestion. But what about Apple Cider Vinegar? I’m gonna keep you in suspense about my current use and thoughts about it for everyday health, cold-relief and even cycling performance! So, this smoothie may not taste like Jamba Juice, but it certainly tastes better than sick, tired, or unhealthy feels. Switch up your smoothie and add more carrots and turmeric to your diet. You’ll get amazing nutrients that will help your body fight, feel great, and keep you pedaling through another cold season.